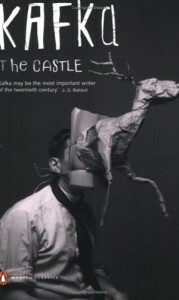 The Castle is one of Kafka’s three unfinished novels and, together with The Trial and “The Metamorphosis,” widely regarded as his masterwork. The plot, in brief: a man named K., a land surveyor by trade, is called into a village at the behest of a mysterious bureaucracy, centered in/manifested by a large, looming castle. Upon arrival, however, he is informed that his summons was a mistake, and all attempts to contact his employers, either to confirm or deny, are thwarted. The villagers, who revere the castle and its inhabitants, become less disposed to help K. when his connection to the castle is called into question. The reader begins the novel more baffled than the protagonist, and is never permitted to know more than K. himself can surmise; thus we are aligned with K. in his pursuit of something resembling truth or closure, a quest that for K. is grounded in his immediate circumstances and yet, for the reader, takes on larger meanings. Because of this, from the outset we are forced to be skeptical of K., for the larger questions forced upon us seemingly escape him. than to be with you all the time, without interruption, endlessly, even though I feel that here in this world there’s no undisturbed place for our love, neither in the village nor anywhere else; and I dream of a grave, deep and narrow, where we could clasp each other in our arms as with clamps, and I would hide my face in you and you would hide your face in me, and nobody would ever see us any more. There they lay, but not in the forgetfulness of the previous night. She was seeking and he was seeking, they raged and contorted their faces and bored their heads into each others bosom in the urgency of seeking something, and their embraces and their tossing limbs did not avail to make them forget, but only reminded them of what they sought. I share Camus’ reading of Kafka, and that of his best critics: that any attempt to allegorize The Castle or The Trial into a mere criticism of bureaucracy requires a stunningly reductive approach, sacrificing much of Kafka’s genius as a writer. K. seeks a transcendent meaning, a higher power, first in the authority of the castle, who seemingly have the entire village in thrall, and then in the arms of Frieda, his lover, and in both cases he is thwarted. His hope, paradoxically, lies not in the attainment of meaning and transcendence but in the disavowal of the quest after these same. Consider this passage from William Butler Yeats’ Per Amica Silentia Lunae as something that could as easily have come from Kafka’s or Camus’ pen: “I shall find the dark grow visible, the void fruitful when I understand I have nothing, that the ringers in the tower have appointed for the hymen of the soul a passing bell.” Yeats is contending, like Kafka, that meaning and fruitfulness are not a product of achievement or attainment but of acceptance, but what they must accept is unpleasant indeed: that the soul’s virginity must remain unbroken, that there is no possible spiritual communion that might correspond with the sexual one. All three men predicate meaning on the acceptance of the mundane, the ordinary, the opaque.